Do you want to help them but don't know what you can do? Then this giveaway is for you! Please visit my post about The Practical Guide to learn more about this book. To enter this giveaway - please let me know if there is anything you have done to help or rescue animals or why you would like to win this book (or who you would like to win it for). This is open to U.S. only. I have one book to giveaway and this giveaway will end Aug 17. Must leave email address in entry to be valid. I am definetly an animal lover. I've been known to stop my car and lure turtles to the other side of the road as well as get help for stray anmials near my home. I also have a herd of cats who stop by my house in the country and eat. I can't touch them but if I can touch them after months of getting to know them, I try to tame them and give them to loving homes. I've been able to save multiple cats that way...I also found a baby bunny outside a few weeks ago and saved him. 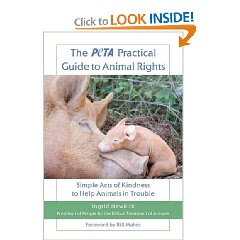 :) Would love to read about PETA's efforts. We adopted our cats from the local animal shelter. We are vegetarians. I would love to win this book. My mother in law is a wildlife rehabilitator in upstate NY (Second Chance WIldlife Rehabilitator Network) and I get to help her out on the weekends. I think she would be thrilled to have this book!